The iPhone — Alien Technology – Coercion Code – "Dark Times are upon us"
Folks we have been lied to …. Whatever you want to call it, Fake News, Fake History…the truth is out there. I have often wondered whether Steve Jobs, the former founder and CEO of Apple is as brilliant as many technology experts say. Compared to other company founders and CEO’s, Steve’s record of innovation and achievement is quite simply: ASTOUNDING and his record is unmatched. Name another CEO who racked up so many new product successes one after another, and has been doing it consistently for decades. You can’t, can you? Steve’s incredible success got me to thinking: What if Steve Jobs had some REAL help along the way? By REAL help I am not talking about assistance from his great team of new product designers and engineers who are reveered throughout the world for their creative genius and spirit of innovation. What I am really getting to is help from the beyond, help that no other company founder or CEO would ever have access to. I am talking about dark forces of the unknown, the kind of help that is so unreal and unimaginable that it would be earth shaking if the public ever became aware of it. Got you thinking, don’t I? 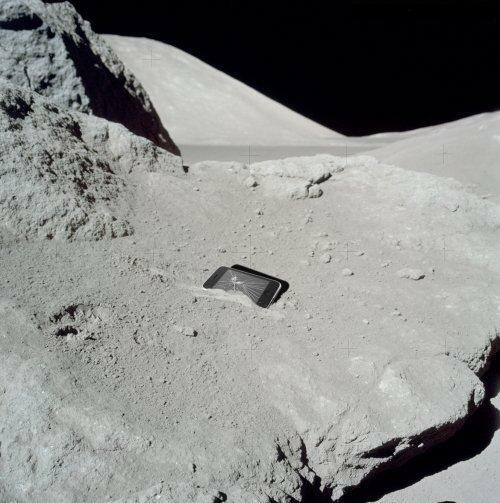 In 1972, Apollo 20 astronauts found a mysterious device of alien origin laying on the surface of the Moon near the Sea of Tranquility, the landing site of several previous Apollo Moon missions. In 1978, Apple’s Steve Jobs was contacted by NASA scientists to determine what it was, and the rest is history. The EMAIL contained the above attached image and following lengthy message. At the top it was labeled Everything Below This Line is Above Top Secret. Since I live dangerously and am something of an outlaw, I will let you read it, and do with it as you may. Just remember one thing, don’t tell anybody else, or you will be erased out of existence. “I am a former Apple employee. I do not wish to get my name out in the public because of the serious and obvious danger to my life if my identity became known. I am posting this under a false name, Simon Apocryphal. I was one of the original Apple employees. It was 1977 and Apple had just introduced the Apple II. I was a hardware engineer by trade, but in Apple’s early days, it wasn’t too uncommon for hardware engineers to work primarily with software. The industry was very young and there were relatively few people with a formal education in computer science. We were told that the government was looking into ways to fund black projects by licensing patents to companies like Apple in exchange for complete secrecy as to the true source of the technology. Private industry in Silicon Valley was responsible for some of the most incredible technological leaps in history and this fact did not go unnoticed by the U.S. government and military. We were told to not speak of this with anyone in the company, not even Steve Wozniak. Furthermore, we were told that the military would perform a thorough background check on us and brief us as to our responsibilities in regards to secrecy. Of course, we were going to need Top Secret security clearance from the government, a process that took a few months and involved the government thoroughly looking into our histories. I remember several of my colleagues being called and questioned about my background. We also filled out a book load of documents basically covering everything from our credit histories to where we went to primary school. It was an invasive process. We met with two men in military uniforms in a large conference room. There are very few moments in life in which your entire world view is turned forever upside down, and for me, this was one of them. I still remember that turning point during the briefing when I realized what we’d just been told, and that I hadn’t heard the speaker wrong, and that it wasn’t some kind of joke. In retrospect the whole thing felt like it was in slow motion. When the term “extra-terrestrial” came up for the first time, the room itself seemed to go off kilter as we collectively tried to grasp what was being said. My mind kept jumping back and forth between trying to look at the speaker, to understand him better, and looking at everyone else around me, to make sure I wasn’t the only one that was hearing this. But I don’t want this story to be about me, so I will spare you any more insights into my emotional state at the time. Our job was to examine recovered alien artifacts and come up with a commercial application for them related to the computer industry. The unnamed engineer and myself spent the next four months being briefed about security and the true nature of the project. I was told that if I ever went public with this information, I would be erased from existence. Furthermore, the agents threatened to erase all my family and friends. We worked under the barrel of a gun. Need to know was the order of the day. We were only given a very narrow description of the origins of the artifacts. We knew that they were of extra-terrestrial origin, but our government partners would not reveal anymore. In fact, they discouraged us from talking about the alien connections and they never brought the subject up unless we asked questions. Getting information about the artifacts was like pulling teeth. Answers were slow to come, if they came at all. As many are aware, Steve Jobs left Apple in 1985 to start NeXT. The official story was that he had a disagreement with John Sculley, Apple’s CEO, over the direction of the company. Here is what I know about what actually happened. Apple’s association with CARMA ended shortly after Steve Jobs left the company. We were officially debriefed by government officials. 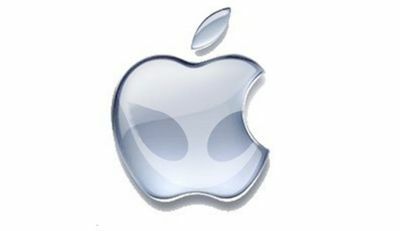 We were told that we were not to ever disclose the program and that we were to continue working at Apple in order to keep tabs on Apple’s use of the alien technology. I worked at Apple until 1992 and have since retired from the computer industry. I currently teach technology at a school that shall remain unnamed. COMMENTARY: I knew it all along. I have been giving Steve Jobs and his Apple munchkins a.k.a. Apple’s new product development engineers, too much credit. It now appears that every product Apple has ever produced probably had its origins from alien technology. Now it all makes sense to me why there are so many Apple mobile products–and it scares me. Aliens are always moving from one galaxy to another. If you are using an app, iPod, iMac, iPhone or iPad, it wasn’t Steve Job’s vision and talent for innovation that created it. It was those evil “Greys” with the dark black almond shaped eyes, and frail bodies. Come to think of it, Jobs looks a bit frail too, don’t you think? Steve Jobs’ mind empowers him to control yours and influence your very being. No wonder those Apple evangelists are such zealots, with a lemming-like behaviors, and crazy over Apple products. They would buy a toilet, if the Apple brand was emblossomed on it. Jobs burned the Apple brand into their feeble-minded brains. They will buy only Apple products for the rest of their tormented lives. Now Jobs is doing the same thing with PC Windows users. Very slowly and with stealth, he is converting Microsoft and Windows PC users to Apple products. But, no Flash. I got to get me an LAAC computer. Screw the mouse and pointer. It’s all in my mind. I can move objects. This blog resides in my head. No more “clickity-clickity” sounds of me typing on a computer keyboard. If anyone knows where I can get one, please leave a comment. I promise not to disclose your identity. Alien technology in Apple? Is that the reason Apple products have some out of control features for simple ones like me?